We are pleased to announce Kids Vision for Life has reached an exciting milestone. 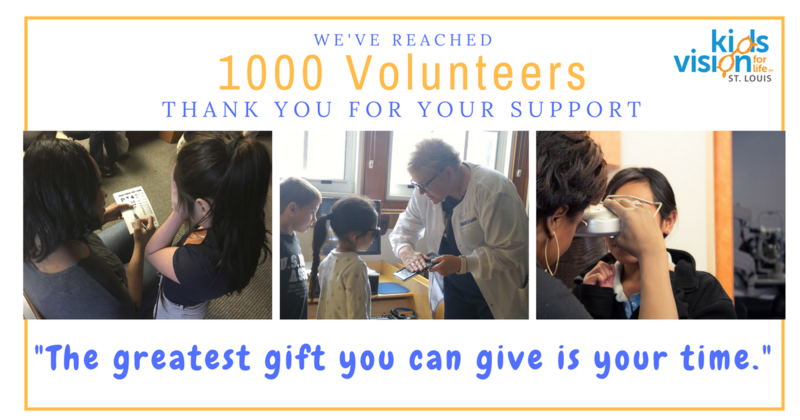 We have had more than 1,000 volunteers participate in our program! We are grateful for our partners who support our mission of eliminating poor vision in the St. Louis community. Our loyal volunteers are a key component to our success. In the fall of 2015, Kids Vision for Life kicked off our volunteer program with the aim of recruiting four volunteers each day to assist our staff on screening days. Our success in attracting additional volunteers has allowed us to conduct vision screenings and vision exams at multiple schools per day. Thanks to the help of our volunteers, we have been able to expand our program to include 50 additional schools in the greater St. Louis area. In the past two years, we have averaged 8 volunteers per day and partnered with 40 different organizations including Fortune 500 companies, Universities, and small local businesses. Five participating organizations are St. Louis nursing schools that send their students to us to complete clinical hours. ← Get Involved with #GivingTuesday at KVFL!